I was so lucky to be included in the Gluten-Free Foodie Tour this month, coordinated by Ken Scheer of Rock a Healthy Lifestyle fame. 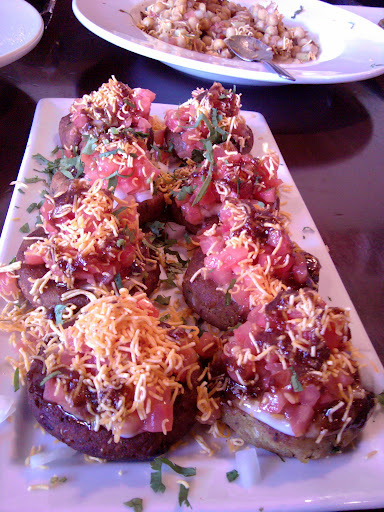 This month’s treat was Bombay Spice Grill & Wine in Paradise Valley. And what a treat it was. There were 50 gluten-free patrons and a meal fit for royalty. Four appetizers, all gluten free, dairy free, egg free and soy free. Three of these were vegetarian! Yippee. Imagine how excited Daughter and I were to find that we wouldn’t be passing on all the good stuff. 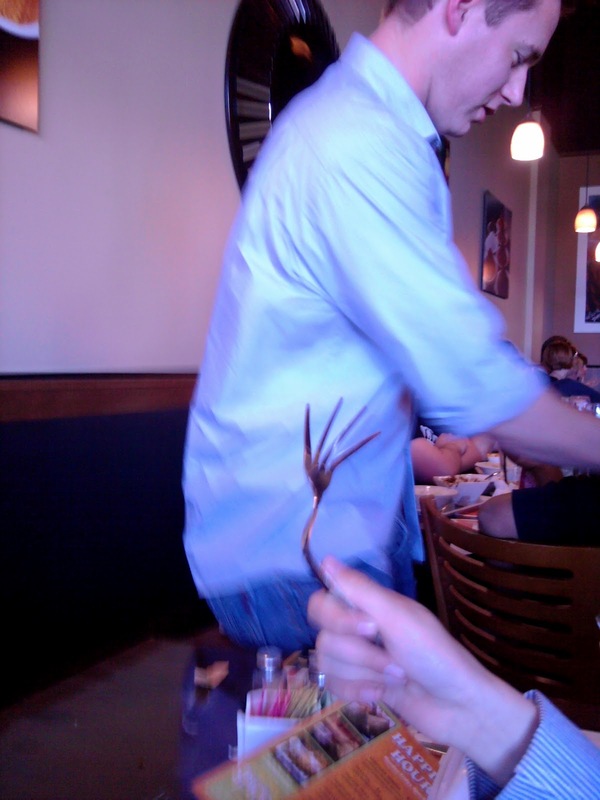 And for an incredibly busy restaurant, we were so pleased at the amazing service. Food just kept coming, refills on drinks were plenty and even $4 mimosas were served. First off, a Mango Salad with baby greens, nuts, dried cranberries and a light mango dressing. A perfect way to start the meal. No photo of that, the bowl was on the table and everyone dove in before I could snap a photo. Trust me, if you go there, give it a try. The dressing was sweet and light, and the dried and fresh fruit made it a refreshing way to start any meal. Next up, Lentil Cake Towers. Beautiful little stacked goodies of warm lentil cakes topped with coconut milk yogurt, tamarind reduction (which tasted like a lovely, sweet balsamic reduction), crispy crumbled poppadum (crackers made with garbanzo) and a tomato/onion mixture. My only complaint would be that I’m not a fan of raw onion on many things. Next time, I’ll order them without the onion. But aside from that, Daughter and I ate a few of them. The cakes reminded me of felafel and I was dying for a pita to plop it in. 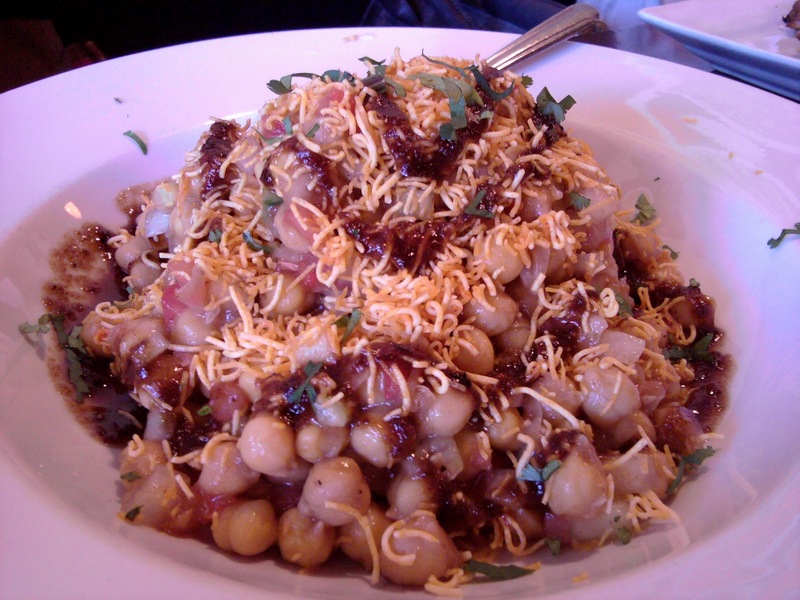 Next, my favorite appetizer was the Chickpea Ceviche. A clever vegetarian twist of beautiful, cold chickpeas, tomatoes, onions, tamarind, coconut milk yogurt and once again those lovely crunchy poppadum crackers crumbled on top. I could have eaten the entire bowl of this sweet, crunchy goodness. The chickpeas were cooked perfectly and the dressing gave it a bit of a kick. I’ll be returning just to make a meal of this fabulous salad, but than again, I’m a fan of chickpeas in most everything. Once again, raw onion will be omitted, but that’s just me. For meat eaters, there were Tandoori chicken wings that were being snatched up left and right. In fact I heard there were multiple orders. Not for me, but if you’re a meat eater you may want to check them out. 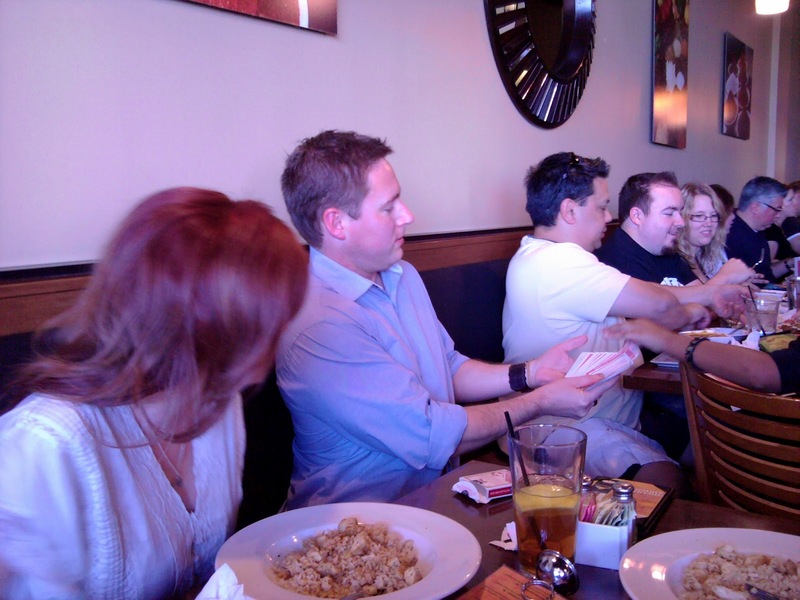 In between the appetizers and the entrees, we were entertained by Luke Brady, a friendly and fun magician in town. He sat with the adults and kids in the room and wowed them with card tricks, bending forks and even crimping a few coins. It’s nice to be entertained and fed well all at once. Thanks Luke! Back to the food, you say? Each person chose one of four entrees. 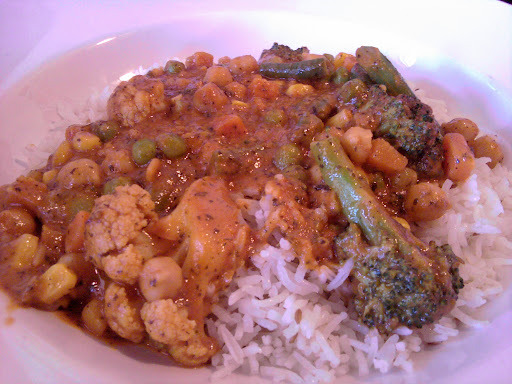 Vegetable or Chicken Tika Masala (tomato-based sauce) and Vegetable or Chicken Curry. All entrees could be served over white rice, brown rice or quinoa. Nice, huh? I love having a choice. Daughter chose the Vegetable Tika Masala over Jasmine rice. I loved it. The sauce was a bit sweet, but not too sweet. Light and tomatoey (is that a word?) with just a slight bite to it (we order mild). Lots of veggies that were nice and crisp, not overcooked at all. 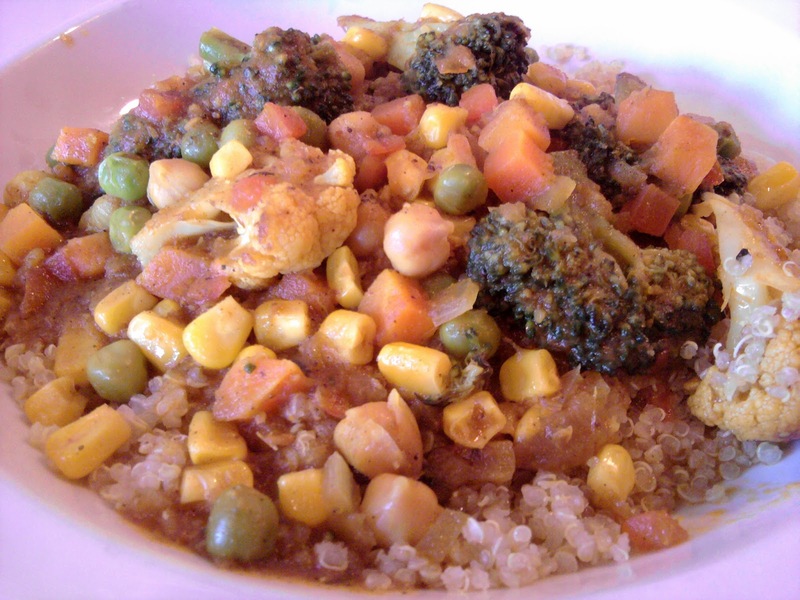 I ordered the Vegetable Curry over quinoa. I loved the quinoa, it adds such a wonderful flavor to most meals. I have to admit I was much more in love with Daughter’s dish than mine. The curry was good, but nothing I would drive out of my way for. I think if I were a huge curry fan, that would be different. In any case, a spicier version might have been better for the curry. But I’ll get the Tika Masal with quinoa for sure. Last, but certainly not least, came a lovely, sweet/tart bowl of mango sorbet with a mango coulis and chopped pistachios on top. I was already full from eating everything else, but I just couldn’t resist trying this fabulous end to an eventful lunch. 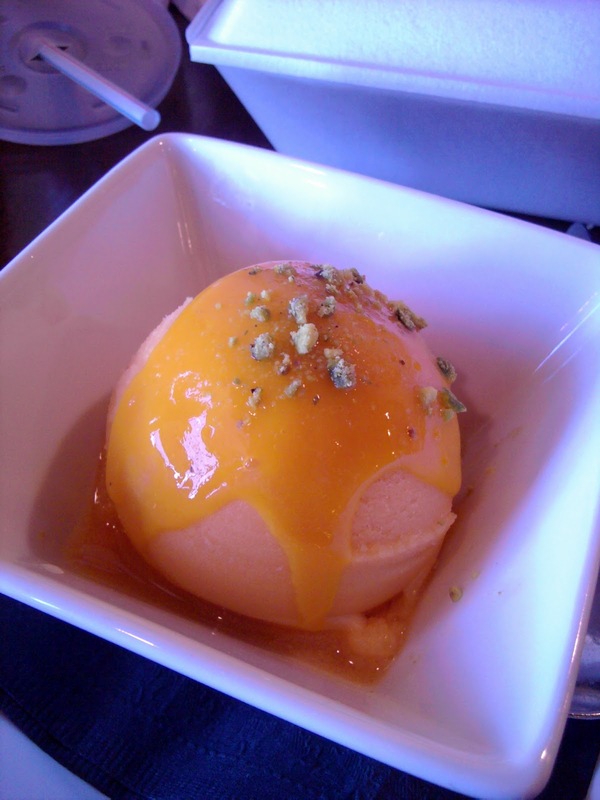 It was like a frozen, silky bite of fresh mango with a hint of sweet and crunchy goodness. I wanted to eat the entire bowl but I didn’t have the room. I’ll save room next time! Thanks again to Ken Scheer and his GF Foodie Tour. Check out the hashtag #gffoodietour on Twitter for a recount and check out his Web site if you’re interested in attending the next one. He’s also got a Facebook page here. Follow it and watch for the next one. Maybe I’ll see you there! Disclaimer: All participants payed for their meal and I was not compensated for this review in any way. And I was glad to pay, it was wonderful! You know, I try to eat healthy every day. There are tons of recipes on here for kale, veggies, salads, etc. But some days, we just wanna’ be bad, right? And when that feeling hits, go with it. Don’t suppress it, don’t deny it. It will only eat away at you. And there are times when the kid in me comes out. I bake cookies, eat pizza, eat ice cream, etc. But the true kid in me emerges when I see a container of Fluff at Cost Plus World Market. If you’re from anywhere east of the Mississippi, you know what a Fluffernutter sandwich is. 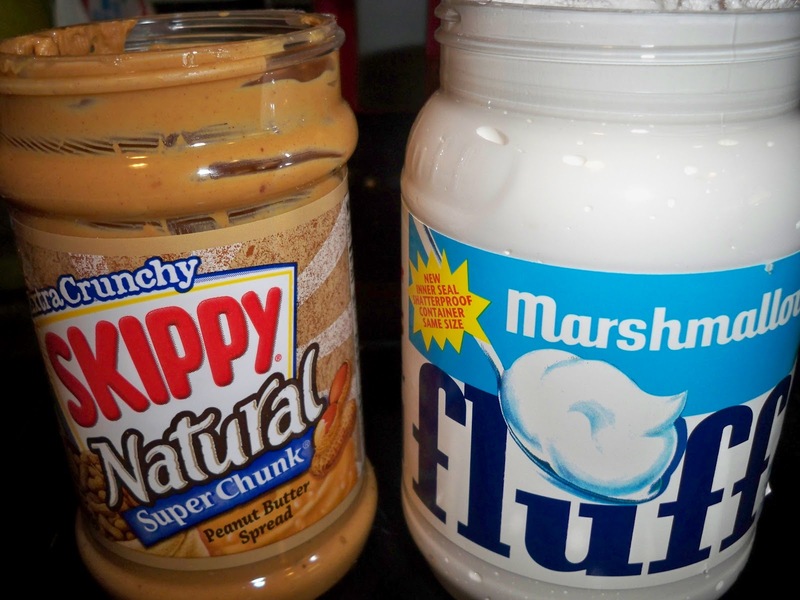 For those of you who don’t know, it consists of loads of peanut butter and marshmallow Fluff on white sandwich bread. Nothing else. Oh yeah. Now don’t scoff, I hear you. Some of you eat meat and I don’t compain, do I? Give me a little slack. This is sweet and salty, somewhat like a chocolate-dipped pretzel or even a s’more. 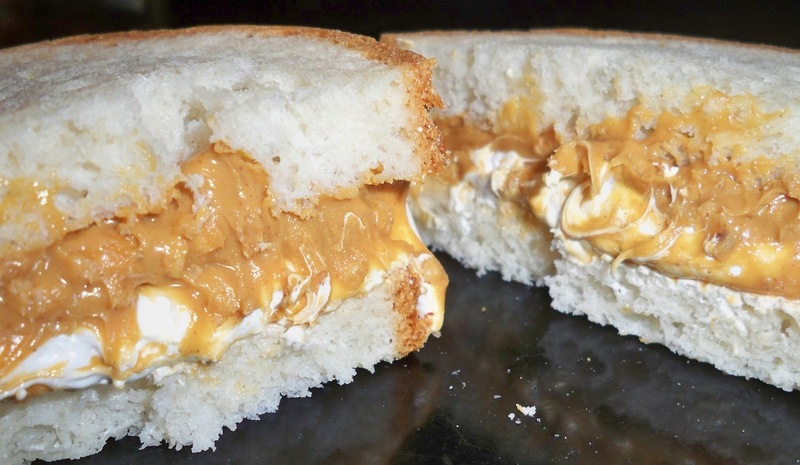 The Fluff is sweet and creamy and the peanut butter (which must be chunky) is salty and crunchy. A great combination for a fabulous treat. Eat it quickly, the Fluff has this beautiful way of oozing out of the sandwich slowly, creating a gooey waterfall of marshmallow. It takes me back to my childhood when my mother would give me one of these when I was especially good. I introduced my girls to this when they were young. Yes, they thought I was crazy at first, until they tried it. Now, it’s a treat about twice a year and oh, do we love it. Gluten-free, Vegetarian Fluffernutters make me happy! But I would be remiss if I didn’t thank Udi’s for making my Fluffernutter dreams come true once again. For so many years after my switch to gluten-free living, this was off limits. The gluten-free bread out there simply was no good unless it was toasted (you know what I mean, right? So many GF breads out there must be toasted just to make them tolerable). A Fluffernutter does not work with toasted bread, I repeat, it does not work. Finally, Udi’s emerged with a gluten-free white sandwich bread that mimics the soft, sweet, and chewy consistency of the kind I remember as a kid. (It even tastes great with just butter, right out of the bag, but Shhhh on that one.) Yes, you can put your Fluffernutter on whole grain bread if you feel the need to put something of nutritional value in there (the peanut butter has protein…) but why bother? So, don’t knock it till you’ve tried it. And if you’re a fellow Easterner, go ahead and indulge. Nobody’s looking and besides, you’re a grown up and that means you can do what you want, when you want, which includes eating a Fluffernutter for dinner!